Hammertoe: No Walk in the Park! Hammertoe is a painful deformity of the second, third, or fourth toe, frequently caused by improper mechanics—the way a person walks or the shoes they wear that do not allow room for the deformity. Similar to mallet toe and claw toe, hammertoe involves different joints of the toe and foot. Shoes that are too narrow or short for the foot, or have excessively high heels, can cause of hammertoe. Improperly sized shoes force the toes into a bent position for long periods, causing the muscles to shorten and bend the toes into the hammertoe deformity. Other causes of hammertoe may be complications from RA (rheumatoid arthritis), osteoarthritis, trauma to the foot, heredity, or CVA (cerebral vascular accident). Symptoms of hammertoe include, but may not be limited to, pain and difficult mobility of the toes, deformity, and calluses or corns from toes abrading one another. A patient experiencing symptoms of hammertoe should seek examination by a physician, specifically a podiatrist. 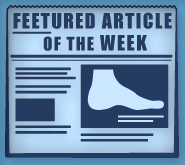 Podiatrists diagnose and treat disorders of the foot. If the doctor finds the involved toes have retained some flexibility, treatment may involve simple exercise, physical therapy, and a better fit to shoes worn by the patient. Treatment often targets controlling the mechanics, such as walking, that cause hammertoe by using custom orthotics. In more advanced cases, where the toes have become rigid and inflexible, the doctor may suggest surgery. The operation would consist of incising the toe to relieve pressure on the tendons. The doctor may re-align tendons and remove small pieces of bone in order to straighten the toe. The insertion of pins may be necessary to fix bones in the proper position while the toe heals. Usually the patient is able to return home on the day of surgery. If surgery is necessary, it is important to follow the postoperative directions of your physician. Theses may include various stretches, attempting to crumple a towel placed flat against your feet, or picking up marbles with your toes. Striving to wear shoes with low heels and ample toe space will ensure healthy feet and toes. Avoid closed shoes and high heels. Laced shoes tend to be roomier and more comfortable. Shoes with a minimum of one half inch space between the tip of your longest toe and the inside of the shoe will provide adequate space, relieve pressure on your toes, and prevent hammertoe from re-occurring. Some tips on feet may include purchasing shoes at mid-day as your feet are smaller in the morning and swell as the day progresses. Ensure that she shoes you buy are both the same size and have the store stretch shoes at painful points to provide for optimum comfort.